There is no doubt that DeMoniZed has the potential to become one of the most popular prohormones on the market. With such a powerful mix of ingredients, it is only a matter of time before it gets on the big scene! As you already might have noticed, Boss Sports Nutrition has started constantly releasing outstanding supplements. More and more of them are being unveiled at their official website, and more and more of them are poised with powerful ingredients that can prove worthy of providing you with good gains. 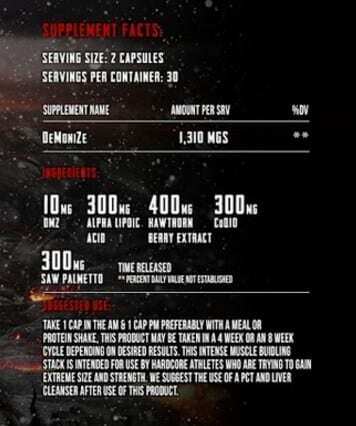 All of this is true for their newest prohormone supplement with a rather interesting name – DeMoniZed. In the paragraphs below, we will further analyze the supplement and provide you with a thorough information about its ingredients. I'm sure all of you are waiting for the more important parts of this review than its introduction… And with that being said, let's jump straight to business then! Beautifully poised with 10mg of DMZ, DeMoniZed is able to provide your body with those much-needed gains in a quick time period. You can expect dry gains, increased vascularity and greatly enhanced strength that will last well beyond your usage period. Despite it being able to provide you with great benefits, DeMoniZed is not that harmful to your body. The folks over at Boss Sports Nutrition have added a plethora of supporting ingredients that will make sure your body is not endangered while on DeMoniZed cycle. What's inside of this product? 10mg of Dymethazine are more than enough to provide you with lean muscle gains. Given the fact that it causes little to no liver issues, it is considered fairly safe in terms of your body's health. Alpha-lipoic acid is a compound that is able to break down carbohydrates in order to make energy for all other organs inside your body. It is well known for its antioxidant abilities as well, making it a great ingredient in products similar to DeMoniZed. This coenzyme resembles vitamins on a molecular level. In addition to its antioxidant properties, CoQ10 also provides your body with more energy which is then used for cell growth. This healthy ingredient is often used for treating many issues with the prostate. It is able to effectively combat prostate enlargement. Some research even suggests it is able to treat prostate cancer as well. In addition to beneficial effects on your prostate, this ingredient is also well known to deal with sore throat, asthma, migraine headache and a plethora of other illnesses. As you can see, DeMoniZed has a pretty good structure of ingredients. 10mg of DMZ is more than enough to provide you with clean, dry gains and a noticeable increase in vascularity. The addition of 300mg Alpha Lipoic Acid means you will have more energy for your workouts which is always something that will come in handy. The supporting ingredients are no joke either. They will ensure your body goes through minimum stress during the cycle. Despite this, a decent PCT supplement is a must after taking DeMoniZed. Moving onto the side effects, there is a high chance you will experience typical skin issues such as excessively oily skin and mild acne. In addition to that, some users have also reported mild anxiety. Keep in mind that this product is not intended for pregnant or nursing women and people with diabetes. If you belong to any of these groups it might be a good idea to stay away from DeMoniZed. What do other people have to say about DeMoniZed? Now that we have taken an in-depth look at this supplement, it's time for a summary. As you could see for yourself, DeMoniZed is packed with top quality ingredients. The dosage is more than enough to provide you with some serious gains, which is exactly what this supplement is all about. Boss Sports Nutrition is really making a great name for itself on the market, and their newest PH supplement DeMoniZed is a great example of just that! Order your bottle of DeMoniZed here for $69.99! Dymethazine, also known as DMZ is commonly used across a wide variety of bodybuilding supplement. Dymethazine is well known for providing its users with massive increases in both muscle size and strength. In addition to this, DMZ also increases vascularity. This is a chemical compound very similar to vitamins. It is commonly found in liver, kidney, spinach and broccoly. It provides its users with a good amount of energy that the body uses for cell growth and stimulation. Unfortunately, there are no clinical research that prove its effects. Saw Palmetto is actually a type of plant whose ripe fruit is used to make all sorts of medicines. Saw Palmetto is most frequently used for treating all sorts of prostate problems. It is even known to treat prostate cancer. Distress or uneasiness of mind caused by fear of danger. DMZ is known to cause anxiety with some people after prolonged usage. If you happen to notice anxiety while taking DeMoniZed, you might want to lower your dosage. Weird sensation of whirling with a possible tendency of falling down. Most likely Saw Palmetto. Although dizziness is a very rare occurence, it is still possible that you may encounter it during a cycle on DeMoniZed. Keep in mind that you should not take this supplement if you are pregnant or you are breastfeeding your newborn. What are the possible side effects of DeMoniZed? How much does DeMoniZed cost? You can get it HERE for as little as $69.99. What do users like about DeMoniZed? The best thing about this supplement is surely its ability to provide the users with increase strength and muscle size. That is why many people opt for it nowadays. YOLO "You Only Lift Once" Review - Can YOLO Really Help You Lose Fat?